« That’s right, it’s time for the loosely triennial website redesign! I happened upon the Graphic Design outfit Build‘s blog this morning, where I discovered their post from earlier this month about de-branding cigarette packages. If you’re gonna read my post, it might be worth giving theirs a look first. This is a government proposal I actually agree with, so I was a little disappointed to see the point in the proposal was a bit overlooked. I was going to suggest Build missed the point, but perhaps it was Icon magazine who missed it, as they set the brief; ‘could [cigarettes] still look good while warning smokers?’. ‘Looking good’ is obviously very subjective, but surely being attractive is what they’re trying to stop with these de-branding proposals. Warning smokers is something that cigarette packaging already does, and would be difficult to make any more effective than it is now*. The exercise in de-branding would be not to make things look bad, but to bring all brands’ packaging onto an equal footing. This would reduce the desirability of the product, which could help reduce the desire to start, and perhaps as a nice side effect, make smokers increasingly feel like they shouldn’t be smoking. 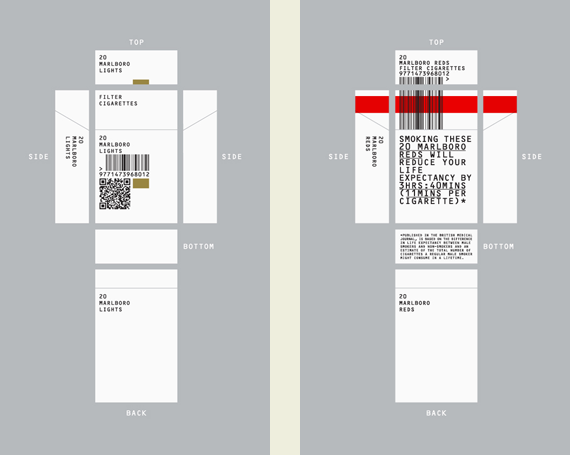 These are two of Build’s cigarette repackaging designs, and are probably the property of Build, not me! 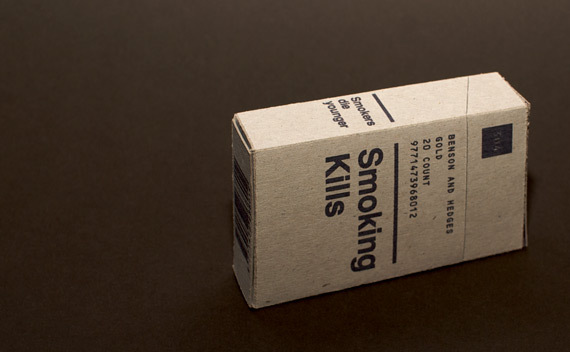 The biggest issue I have with Build’s designs are that they haven’t de-branded cigarettes- they’ve just re-branded them. This makes for very pretty packaging, but still offers identity and an unnecessary sense of luxury, which is what is meant to be eliminated by putting them in plain packages. Cigarette branding and packaging is like a designer label on clothes, and is something cigarette manufacturers and the marketing companies they commission have been striving to achieve since the brands existed. There is evidence of this at TobaccoPapers.com, which is an archive of the communications between the tobacco industry and their creative agencies in the mid-ninties . Time to get a bit more constructive with my criticism. If security was necessary to prove items aren’t counterfeited, a foil blocked square isn’t going to stop anybody- cigarettes are already covered with the most gratuitous production finishes around, and still get counterfeited. If this was really an issue, a much better solution would be to replace the ‘UK Duty Paid’ stamp with a hologram to the same effect. Foil blocking in this case is superfluous and addes a sense of luxury that is meant to be going. There are more effective ways of helping tobacconists identify the product a smoker is asking for. There are already plans to remove cigarettes from public display, so shopkeepers could store cigarettes in a much more organised fashion and have the brand clearly marked on their storage system than on the packaging themselves. If an identifier is necessary, though, I would propose giving formats, varieties and brands of cigarettes a random number, assigned to a product when it is added to the unbranded system. The benefit of the numbers being random would mean that even different sized packages of the same brand would be plain and indifferent to each other. Brand-x 20packs could be assigned the number ‘179’, while a 10-pack of the same product is assigned ‘032’. This would further diffuse the brand, reducing its aspirational values to smokers both new and old. Smokers could end up referring to their choice of cigarettes by numbers, where no one brand would come off as being better than the other, and would undo the work put into making some of the ‘light’ or ‘low tar’ brands come across as being a lesser evil than regular brands. I actually quite like Build’s proposal to use OCR-B for the typeface. In a way it’s genius, as it genericises and offers very little personality with very little room for tampering with the design. The problem with it, however, is that it can look too robotic, making things such as the smoking warning look like the information is not there to be read by people. Perhaps the best compromise would be to keep the health warning in a neutral sans-serif, but put the product information in the OCR-B. Considering all of this, here is my take on de-branding cigarettes. They may not be as pretty as Build’s designs, but their attractiveness is precisely what made the design a unsuccessful in my opinion. These are meant to be plain, unbranded packages, so there is no reason to have the brand name of the cigarette on more than the front-facing surface. With this design, 50% of the major surfaces are focussed on health warnings. 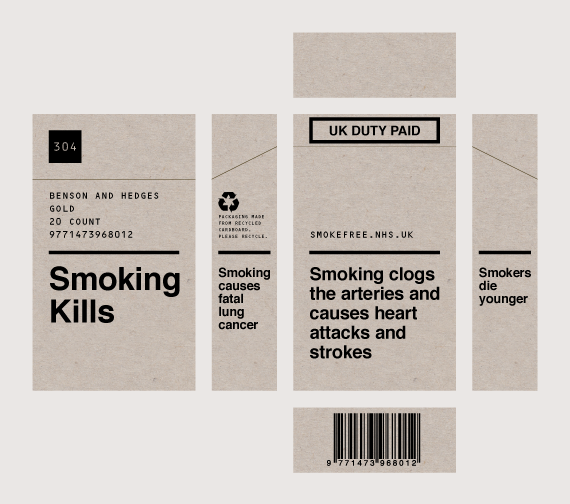 This design eliminates the power of branding from cigarettes, levelling the playing field and reducing desirability. Using unbleached recycled cardboard for the packaging serves as a subtle way to encourage responsibility in the packaging (even if you can’t do so with the product!) and not bleaching the card would be one less chemical finding its way into the world from cigarettes. Aside from the ecological benefits, white is a bad choice psychologically/graphically as two of the biggest connotations with the colour white are innocence and cleanliness, neither of which apply to cigarettes or their manufacturers. My design might not be as attractive as Build’s, but I would like to believe the design is more successful at de-branding packaging without abandoning good design principals.